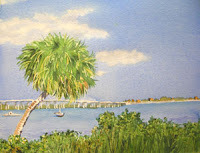 For those of you who may like to paint along with my blog, this piece, Palm Tree On Indian River, will be posted this weekend. For $5 you will receive the photo reference and the drawing via email. You can then follow along as we paint this picture together. The focus is going to be on how to do masking, and a short lesson on clouds. To order your references, visit my etsy shop and choose the online class icon. Hope you can join us.